Why do I become an artist? Lately, I have been really digging deep into my self about why I become an artist. Before, I've been brushing it off with a generic answer - "Because I like to paint". While there is nothing wrong with this answer, I know it is deeper than that. The more I thought about it, the more I know it's not just about me. I am not a very self-motivated person. Ask any of my high school teachers and you will know. I was such a poor student, I barely graduated from high school. Soon after I graduated from art college, I started to regret how I was just coasting through. It wasn’t until my wife got pregnant with our first child did I realized that I really need to get my act together! Since then, I got really motivated and was driven to become a better person than I was yesterday. It was that motivation that got me my job as an artist in the video game industry at Microsoft. Because of that, I was convinced that the reason I am determined to become an artist is not just for myself. Any urge I have for myself is usually very short lived. Only when I am doing things that can give others values do I have the passion to urge me to keep going every day. I want to create art that connect people to their memories and experiences. So they remember that they are loved and accepted. One of the most rewarding thing for me is to help people realize their value. I have a box full of notes, cards and letters that were handwritten to me throughout the years. Whenever I see them, I was reminded that I am loved. It's a physical evidence that there were people willing to spend their time and handwrite those to me. When I hear some 90's music, I travel back in time to my middle and high school years. I remember that things were tough for me. I was struggling to make friends and wondering where I belong. The memories might not be all good, but they give me clarity of who I am today. Without knowing where I was coming from, I might not know where I should go. Things that help me to connect with my past is extremely important to me. As an artist, I am gifted with the ability to create such things. The painting above that I painted for my family is from our family vacation last year. It is one of the paintings that I will never sell. My wife told me every time she looked at it, it reminded her of the wonderful time we had together on the Disney Castaway Cay. Vacation will end and kids will grow up. 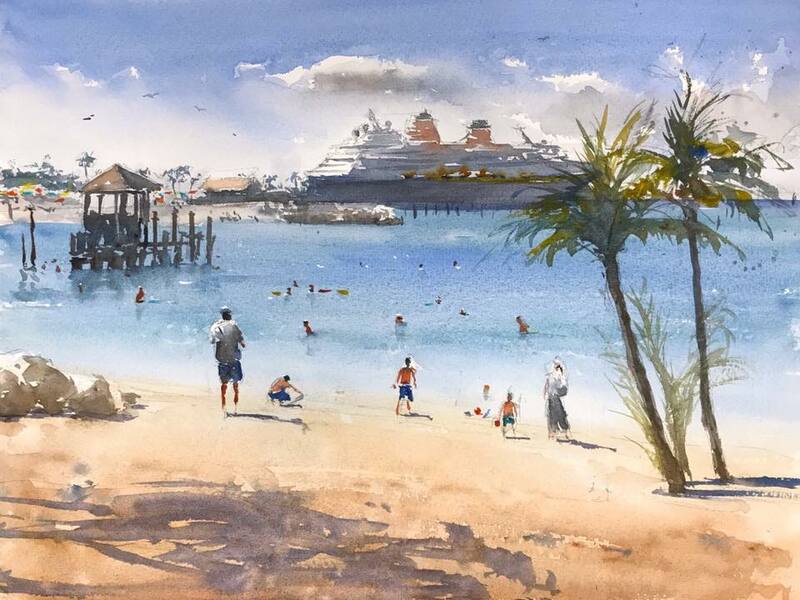 But that painting is an evidence that we shared a wonderful time together as a family: the warm turquoise tropical water, the deep blue sky, and the Caribbean style Disney music. All will be recalled by looking at this painting. Yes, there are photographs and videos we took throughout the years. But I believe a painting captures the memory and the feeling. Like my friend Justin has said about my painting "If photos are a visual record, Eric’s work is a record of the heart." Whenever a collector and client said to me "this brought me back to that time of my life" or "this look just like how I remembered it." I know I have made something really special for them. And when the paintings I made have brought their owners tears, I know this is what I was meant to do. It might sound cheesy and cringy but this is my mission as an artist. And this passion made an introvert like me writing to you now.